The low top trainers from Amsterdam-based footwear label, Filling Pieces, arrive in grey nappa leather with a sleek matte finish. Handcrafted in Portugal, the 'Mondo' sneakers feature a rounded toe, a logo-embossed tongue and tonal waxed cotton laces. Gold-toned foil branding features on the leather lining. Set on the brand's custom 'Fundament Ripple' sole for increased traction. 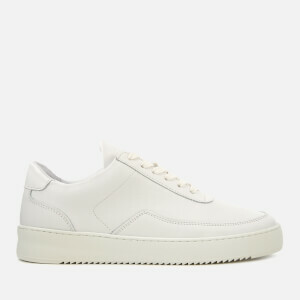 A padded ankle collar and tonal stitching complete the minimalistic design.